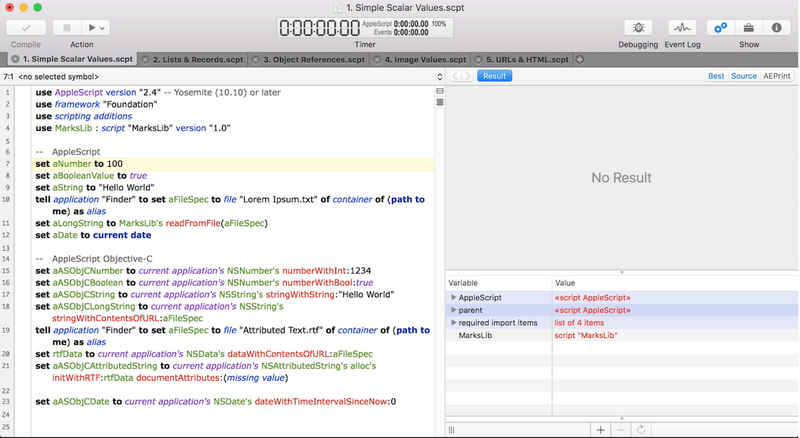 Script Debugger 7.0.6 – AppleScript authoring environment. Fixed issue where handler highlighting sometimes failed. Improved behavior of Paste Tell submenus under Mojave when permission is required to send Apple events to the targeted application. Resolved some visual glitches in the save confirmation panel that appears when closing a window containing multiple documents with unsaved edits. A bug in the Enhanced Applet shell preventing the AppleScript continue statement from working has been resolved. . Fixed an issue where saving via script would remove a document’s codesign identity. Resolved a crash that can sometimes occur when closing split view panes. Prompts in choose from list and titles in display dialog now appear correctly in Enhanced Applets. Resolved an intermittent crash that can occur when exploring Adobe applications. Fixed bug where text of prompt for choose from list command was ignored in Enhanced Applets. Standard Addition dialog commands can now be called on a background thread in Enhanced Applets. Before codesigning a bundle, Script Debugger will also attempt to remove any extended attributes from the bundle file itself. Next story AppCode 2018.3.4 – Objective-C IDE for developers.